St. John’s Wort (Hypericum perforatum) has been used for centuries as both a healing herb. It has been nicknamed the wonder herb by many of the herbalists of history. It can be used both internally, as well as externally. It was once even used in magical rituals. It is also known in some areas as goatweed, Klamath weed, Tipton’s weed, Rosin Rose and Chase Devil, or Devil Chase. St. John’s Wort gets it’s healing properties from the hypericin in the flowers. When the freshly picked flowers are steeped in oil, the oil turns a beautiful, deep red color. A tincture of the flowers can also be made using the fresh flowers. The tincture of St. John’s Wort would be used internally as a treatment for mild depression and anxiety. A tincture is made by steeping the fresh flowers in alcohol such as vodka. The flowers are steeped for 6 weeks, and then strained off. 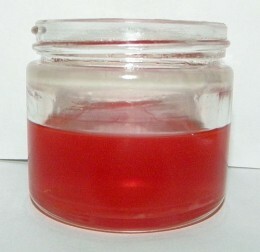 The remaining liquid is bottled in a dark glass jar for later use. To treat mild depression, 10-15 drops would be used up to three times a day. Dosage and length of treatment always depends on the patient. It should not be used for more than two month at a time. To make a tea, add 2 tablespoons of dried herb to hot water. Let steep for about 10 minutes. Strain, and drink 2-3 cups per day. Add honey, or your favorite sweetener to you tea. If you are using fresh herb, you will need twice the amount. Dried herbs are always more concentrated than the fresh plant. When infused in oil, the yellow flowers of St. John’s Wort makes a wonderful red oil. The oil is used to treat sciatica, skin issues, and muscle pain. Sciatica is a very painful condition. It is usually caused by a pinched or irritated nerve. 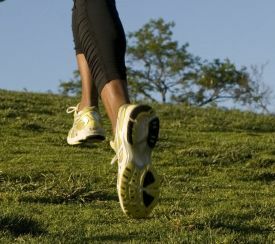 The pain can be in the lower back, but also can run down the leg. Using St. John’s Wort infused oil can help to lessen the pain and inflammation from nerve pain. Rub into the affected area three to four times a day while the pain exists. The name St. John’s Wort came from very early Christians who named it after John the Baptist. The brightly colored, yellow flowers usually bloom around June 24th, the day that his birth is celebrated. In Europe, St. John’s Day is celebrated on the day of the Summer Solstice, which is normally around June 21. St. John’s Wort oil can help to heal nerve damage due to injury or surgery. Rub the oil into the area, and bandage if necessary. Repeat up to five times a day. The oil can be mixed with comfrey for it’s tissue healing benefits and calendula for it’s anti inflammatory properties. Due to it’s antiviral properties, using a tincture of St. John’s Wort is a wonderful way to clean out a cut, scrape or minor wound. Dilute equal amounts of tincture and water into a bowl of warm water. Clean cut well and dry off gently. Bandage, and keep wound clean. The oil is a strong antiviral and can also be used as a styptic.When used on a cut, scrape or skin sore, it will help to heal it more quickly than leaving it alone. Rub the oil gently onto the skin. It may be used up to 5 times a day. Be sure to clean area well before each use. Bandage if necessary. St. John’s Wort taken as a tea, or a tincture can be helpful in fighting the fatigue and cramps that come along with PMS. The tincture would be taken 3 times a day, using 10 -15 drops added to a warm tea. For a tea, drink 3-4 cups a day. Use one, or the other, but not both. Use only while symptoms are present. Rubbing the oil onto the belly is also helpful with alleviating cramps. Because of it’s antiviral properties, St. John’s Wort tincture, or strong infusion (tea) can be used to help heal boils or carbuncles. Many boils are caused by a virus on the skin. Take the tincture and dilute equal amounts with warm water. Clean the area well, and pat dry. If the infusion is used, it does not have to be diluted. Use as is, and clean the area. Dab on infused St. John’s Wort oil, and bandage if necessary. Keep area as clean as possible for better healing. Alone, St. John’s Wort is a wonderful healing oil. When mixed with other herbs such as comfrey, arnica, or willow, it can be made into a healing salve for pain and inflammation of sore muscles, joints and even rheumatism. It has even been used to treat tendonitis and fibromylagia. It’s not very choosing on soil. It likes sandy type of soil, but can also tolerate other soils as well. It can be grown by seed in the spring, or bought at your local garden center. Plant where it will get at least 8 hours of sun during the summer months. After it goes to seed, it can be cut back. While St. John’s Wort is an effective herb for treating many ailments, it does have many interactions with medicines. If you are taking any medications, it is suggested that you read the article St. John’s Wort Interactions for a more complete list of contraindications. It is natural, but it has more contraindications than other herbs. St. John’s Wort should not be used if you are already taking medication for anxiety or depression. There are also other medications it interacts with. As with any herb, it should not be used if an allergy to the plant is present. It is always best to seek a health care professional that is well versed in herbs before starting an herbal regimen. Always talk with your doctor before going off any medications. 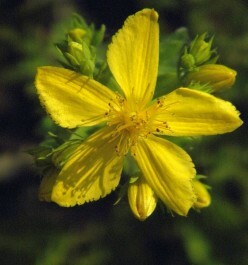 St. John’s Wort can cause sun sensitivity. As with each herb, they are natural, but they are medicine. Treat them with care and respect. More does not equal faster or better results. Freshly picked St. John’s Wort flower ready to be processed. This article is just an overview of the healing powers and properties of the herb. If you are looking for more in depth information on healing with St. John’s Wort herb, you can visit “Healing Benefits of St. John’s Wort”. You can also visit the Herbal Encyclopedia where there is a wealth of information on St. John’s as well as many other herbs. The statement about the herb discussed has not been evaluated by the Food and Drug Administration. This article is not intended to diagnose, treat, cure, or prevent any disease. The information in this article is based on a thousand years of traditional herbal knowledge and experience. 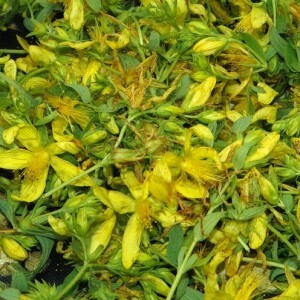 View the all natural herbal products that Cloverleaf Farm offers that contain St. John’s Wort.